Solutions Of Reducing Cost Of Studying Abroad With Bachelor Of Business Studies – BBS Pathway. Desire to explore the outside world, to study in the international environment, to communicate in English often – Studying abroad has become a dream of many young people. Besides traditional well-known destinations such as the United Kingdom, the United States, Australia, Canada… in recent years New Zealand emerged as an ideal choice. New Zealand has a high quality education, a peaceful country, beautiful, friendly people, hospitality, the cost of studying is only 2/3 or even half of other Western European countries. 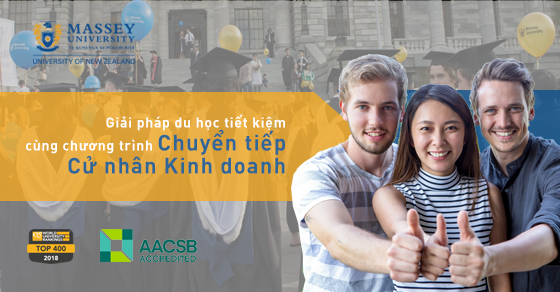 This dream of studying abroad can be made more advantageous with the BBS Pathway with flexible transfer form; 1 + 3; 1.5 + 2.5; 2 + 2; 2.5 + 1.5, with maximum recognition of the subjects you have completed in Vietnam. Massey University – founded 1927 – with more than 90 years of experience, is one of the three largest universities in New Zealand, the School of Finance ranked first place in New Zealand and ranked 12th in the Asia-Pacific region. Massey University is ranked among the top 300 universities in the world by the The Times Higher Education http://www.timeshighereducation.co.uk and QS World Universities Rankings http: // www. topuniversities.com. In 2009, Massey University was honored by the Association to Advance Collegiate Schools of Business- AACSB http://www.aacsb.edu accredited and recognized and recognized as the top 5% of world-class universities. .
Massey University has over 36,000 students, including nearly 5,000 international students from more than 100 countries studying in three major campuses in the capital – Wellington and two major cities of Auckland and Palmerston.